While many have the perception that vegan food means carrot sticks and humus with a side dish of healthy, Lekker Vegan flips the tables on this common misconception. Usually vegan offerings at restaurants include the likes of uninspiring leafy salads, healthy Asian broths with exotic ingredients or expensive plant-based protein smoothies. Lekker Vegan, on the other hand, serves plant-based eaters the opportunity to indulge in their most guilty food pleasures – gourmet style. 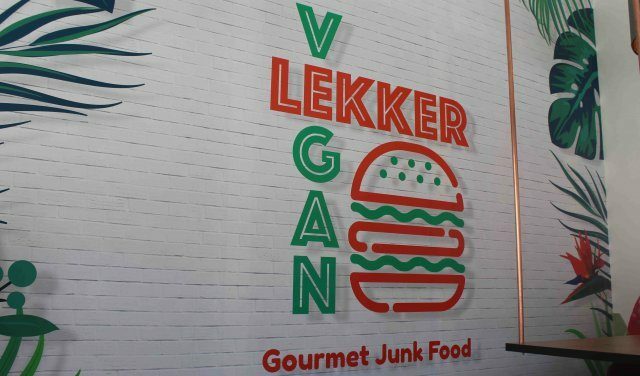 Lekker Vegan wins restaurant of the year in the fast food department. On offer in their Harrington and Kloof Street restaurants is everything from simple comfort food such as toasties and greasy burgers, to healthier wrap options, to smaller sized snack options. Larger-than-life Gatsbys will be a fulfilling pick for the hungriest of herbivores, while a snacker may enjoy a plate of vegan nuggets, a chip roll or the classic side option of crispy potato chips. They have sweet potato chips too. Mmm… yum! The best part of it all? Decadent vegan dessert options are plentiful. No more date balls and carob coated almonds. Think vegan soft serve, apple crumble pie and vegan chocolate cheese cake. Now that’s a great vegan dessert menu. Lekker Vegan serves most of their menu items on simple boards or in typical fast food styled parcels so you can eat your way to tummy satisfaction while on the move. If you’re looking for a spot to settle for a while instead, there are ample seating options available to you – just take your pick. The fun, contemporary décor and upbeat atmosphere is sure to lift your spirits. If you’re less interested in the space of a restaurant and are more drawn to the social side of life, there is no doubt that you will be feeling lekker at Lekker Vegan. Once you are met at the door with smiling faces and an occasional dance move from those who work at Lekker Vegan, you will be wondering why you didn’t pay them a visit earlier. If you thought eating vegan meant ordering salads and sipping on fresh kale juices, a quick drive by at Lekker Vegan is sure to change your mind. Note: They do not make table bookings or take phone-ins.